Karachi The dollar hit another record high against the rupee in the interbank market. It opened the day�s trading at Rs 98.84 for buying, strengthened by nine paisas and closed at Rs 98.93 for buying and Rs 98.98 for selling. The euro rebounded against the local currency as it began the day�s trading at Rs 130.32 for buying, gained 52 paisas and closed at Rs 130.84 for buying and Rs 131.04 for selling. 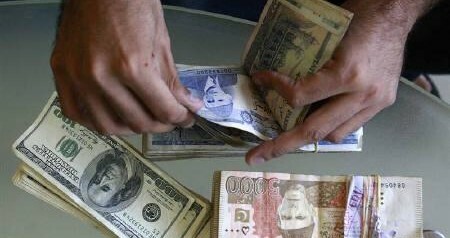 Similarly, the British pound bounced back versus the rupee as it started the day�s trading at Rs 152.64 for buying, increased by 53 paisas and closed at Rs 153.17 for buying and Rs 153.37 for selling. Open market: The dollar appreciated against the rupee, dealers said. It opened the day�s trading at Rs 99.85 for buying, rose five paisas and closed at Rs 99.90 for buying and Rs 100.15 for selling.